Sung in French with on screen subtitles in GB, Fr, GR. Poulenc’s three act opera Dialogues des Carmélites is reasonably well represented on DVD yet there are only two Blu-rays in the catalogue. It is pleasing therefore to have another available recording especially one as excellent as this. Staged in 2013 the year marking the 50th anniversary of Francis Poulenc’s death, Olivier Py’s new production was filmed live by François-René Martin from the Théâtre des Champs-Elysées, Paris. Py fashions 'his' drama with decisive set design and lighting and some intelligent stage effects. A mainly French cast, featuring four of the finest French female singers on the stage today, is a welcome bonus. 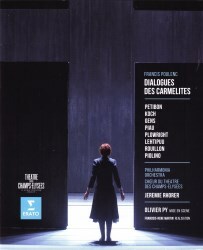 Widely acknowledged as a masterpiece Dialogues des Carmélites is a complex emotional mix of personal relationships, religion and revolution. Poulenc wrote his own libretto based on Georges Bernanos’s screenplay of the Gertrud von Le Fort novella Die Letzte am Schafott. Largely based on actual historical events at the time of the French Revolution the scenario concerns the Carmelite sisters of Compiègne who chose martyrdom and were guillotined in 1794 by the revolutionary government. In each of the three acts there are four tableaux with short orchestral interludes containing some of Poulenc’s most glorious music. Olivier Py’s staging concentrates on the emotional power of Poulenc’s score with nothing too extraneous on the set to distract the audience. Against a background of fear, owing to the revolution in progress, inside the Carmelite Convent the relationship that builds between the nuns is extraordinary. It has a depth of intensity that I have not seen achieved previously. Looking rather dark, austere and a touch claustrophobic the narrowed stage was constructed at the sides with substantial grey boards that could be altered. For some of the time the rear wall was adjusted to form a large sacred cross illuminated from behind or a forest scene of leafless trees in silhouette. A regular in Py’s production team Pierre-André Weitz excels with his cleverly conceived set using the simplest of costumes for the nuns while the two French aristocrats the Marquis and Chevalier are grandly clothed in dress of the period. In truth much more successful were the costumes used by designer Falk Bauer in Robert Carsen’s 2014 production of Poulenc’s opera at the Royal Opera House. Perhaps the cleverest stage effect was having Rosalind Plowright as the old Prioress on a deathbed that was secured to the back wall of the set as if the audience was looking from above. Py’s visualisation didn’t include a scaffold or a guillotine on the stage but left it to the imagination. To the affecting sound of the Salve Regina the guillotine is heard as it does its horrendous business and in turn the nuns disappear from view at the back of the stage ending with the camera looking up to the stars. I couldn’t imagine a finer portrayal of the emotionally complex character Blanche than that achieved by the entrancing Patricia Petibon. Her unwaveringly empathetic acting and creamy, expressive voice made Petibon the perfect choice for this challenging role. Highly assured, Sophie Koch in the part of Mother Marie was serious on the surface yet revealed a more compassionate persona beneath. Secure and agreeable, Koch’s voice was in splendid condition. Some adverse comment has been written about Rosalind Plowright, one of two non-French performers, in the part of the ailing Prioress de Croissy. Whilst certainly not vocally perfect Plowright’s singing retains the ability to move and I found her acting in the death scene most persuasive. Véronique Gens excelled as the Convent’s new Prioress Lidoine colouring her text superbly as did Sandrine Piau as Blanche’s fellow novice, the rather immature Sister Constance. Although capable and looking the part of the Chevalier, Topi Lehtipuu, another non-French performer, lacked fluidity and general assurance. François Piolino, the Father Confessor, displayed a bright vocal that grew in assurance and Philippe Rouillon as the Marquis gave everything asked of him. Under Jérémie Rhorer’s baton the playing of the Philharmonia was as consistently accomplished as I have heard on a live opera house recording. Presenting a perceptive view of the score Rhorer maintained a judicious pace with plenty of momentum. Poulenc’s beautiful orchestration was displayed to good effect especially the woodwind section with stunning cor anglais solos. Clearly impeccably prepared I couldn’t fault the intelligent and unified singing of the Chœur de Théâtre des Champs-Elysées. The sound formats employed on this Blu-ray disc are Dolby 5.1 and LPCM Stereo 2.0ch 48kHz/16 bit which somewhat surprisingly does not utilise the DTS-HD Master Audio option. Nevertheless the sound quality was vividly clear and decently balanced. The video direction is generally excellent employing cameras actively and never allowing the viewer to tire or experience monotony. I did notice when there was action on the stage the camera didn’t show any orchestral players in the pit for solos. Although satisfactory the HD picture quality was limited by the predominantly gloomy, grey lighting that I guess is designed to provide a severe, rather menacing effect. In the accompanying booklet the synopsis provided is a traditional scenario of the opera which is not totally in step with what we saw on stage. Memorable and powerfully charged, Olivier Py’s staging of Poulenc’s masterpiece Dialogues des Carmélites deserves praise and a firm recommendation.